A World of Many Hats and Not Enough Shoes - Third Stop: Moab Pause! Our extra day planned in Moab would be our gateway drug to this amazing part of Utah. Third Stop: Pause in Moab. At National Parks you can buy a National Park Pass that is good for a whole year and will get you into all the National Parks for free. (With a couple exceptions.) We knew we would be visiting other national parks in our trip and bought the year pass. Every year since, we have continued to buy the pass, have never regretted it, and definitely get our money's worth! Arches National Park is a short 2 mile drive north of Moab and, as the name implies, home to the beautiful arches you see on the Utah signs and license plates. We chose our first hike of the day to be the longer hike to Delicate Arch, the most famous arch. Being the morning in the desert in early October, we didn't know exactly what the weather would bring. We wore light coats and packed day packs with stocking hats and light gloves, shorts, ball caps, lots of water, and snack bars. Being this was the kids' first big hike in the desert, we didn't know what their attitudes would bring either. I would love to tell you that all our children LOVE hiking as much as my husband and I do, but truth be told, 2/3 of our kids are not fans of hiking because a "normal" hike for our family is generally intense. The 2/3 will do it, but we have to find ways to entice or distract them along the way. This hike we enticed them with hunting for collared lizards and desert kangaroo rats and having awesome trail snacks. The last 200 yards of the hike are along a rock ledge about 3' wide. The ledge drops way down to the left and is a wall on your right. I had the kids walk with their hands on the wall in order to keep my heart in my chest. But my faster pace heart was blown away by the beauty at the summit. The view of Delicate Arch is amazing. The slickrock bowl you have to walk in to get to the arch is another heart beater, but completely worth it. The kids had made it the mile and a half to the summit but as we started the trip back some attitudes were starting to wane. We changed the subject to hunting lizards and spirits were revived! Parents FTW! 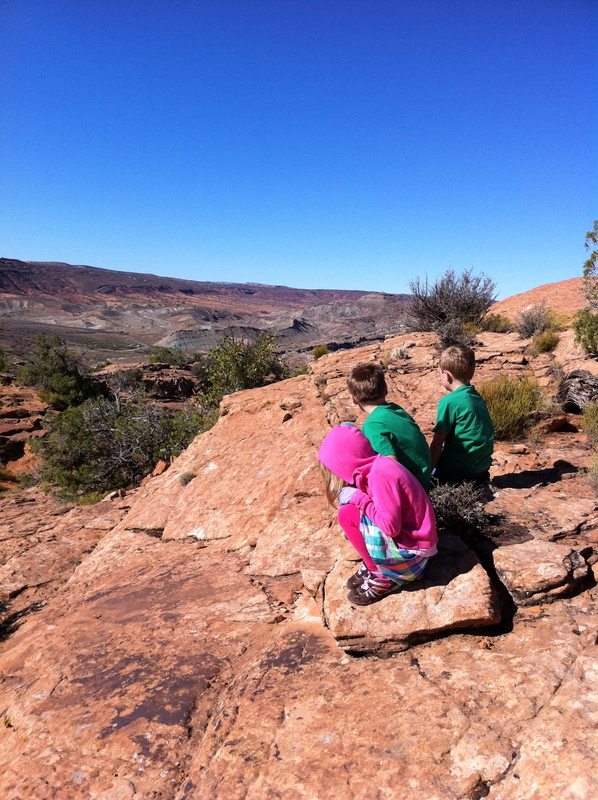 We got off the main trail and out of sight and the kids hunted lizards atop this beautiful slickrock area for a solid hour. When it was time to finally make the trek down, everyone was ready and excitedly talking about the near catches they had. Then just as we were ending the hike a child called out, "A lizard! I can catch it!" And he did. And it bit him. And he was shocked. And he was embarrassed. And he quietly cried to himself. Poor guy. 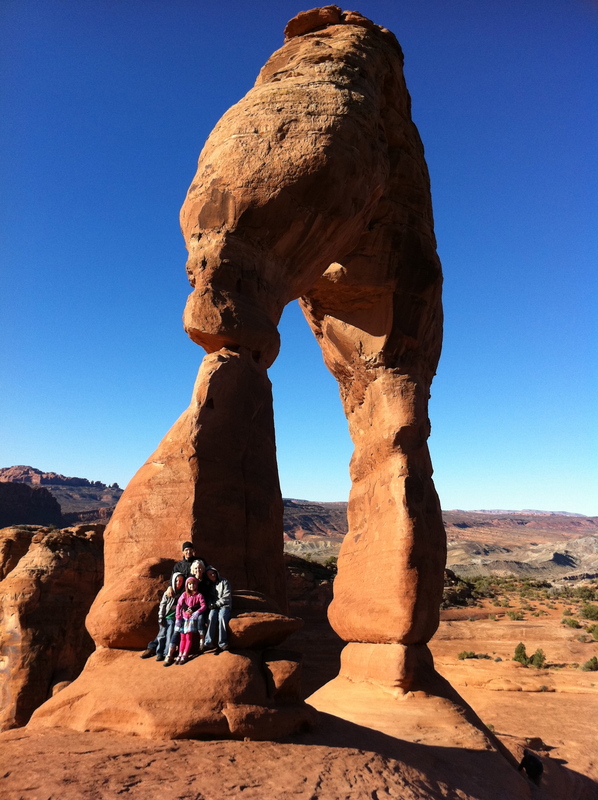 We would continue this day in Arches with a hike to Sand Dune Arch and Landscape Arch. Landscape Arch, being our last hike of the day, after hiking 4 miles already, was like pulling teeth to get there, but knowing if they survived it, we'd have time to go to the massive sand hill. And they did it. And 1/3 of them liked it. :)! In order to make certain we sucked all the marrow out of this absolutely beautiful day, we decided to put off dinner a little longer and drive up along Potash Road just in time to watch the sun set through the canyon. Potash Road continues along the Colorado River and goes west from the town of Moab. It is home to a famous climbing area called Wall Street, has lots of petrogylphs, actual dinosaur tracks, and countless hikes and canyons that shoot off from the river. By the time we returned to our hotel, it was way past bedtime. We ordered Thai take-out and everyone recounted the stories of our not-so-lazy but definitely peaceful-pause of a Sunday. From finally being able to laugh about the lizard bite to enjoying running up and down the 100' Sand Hill, everyone was in good spirits as they snarfed down pad Thai and curry. The day truly felt like an honest to goodness family vacation day. To be honest, we hadn't really enjoyed time like that in the last year, just us 5, being ourselves, watching cartoons in the hotel, truly enjoying life together. For us as parents, all the "fun" moments we had during the last year were shrouded with the weight of all the other issues bearing down on us and our smiles were forced. For our kids, while they did not feel the weight like we were, they could see it in us. They knew. But this day, this day they could tell, they could tell it was not forced. No Responses to Third Stop: Moab Pause!